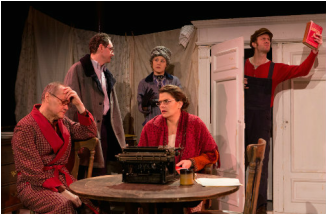 "Props go to Levesque for her manipulation of voice timbre and nuanced expressions to punctuate the text's rich comedic and tragic undertones." ​"Praskovya (Jessica Levesque) who makes truculence delightful"
"Rounding out the strong performances were Erin Biernard as Bulgakov’s loyal to a fault wife Yelena and Jessica Levesque who tells an enthralling story as a woman who cleans up after executions by simply using body language, physical tempo, and minimal words." "Her foil, Léonor, (Jessica Levesque) unites an austere presence with a commanding voice in a way that grounds the excitable princess. Ultimately, hers is the most consistent performance in what is, on balance, a strong cast." "The fine supporting cast includes a particularly meritorious performance by Jessica Levesque as Léonor, the Infanta's lady-in-waiting, who uses her commanding presence and diction to excellent effect as by turns she counsels and chides her charge." "Some standouts: .....Jessica Levesque as a scarily efficient secretary." "Imagine “Pygmalion” written by the Marx Brothers. Starring Gordon Gekko from “Wall Street.” On speed. That about sums up THE PRESIDENT, a madcap comedy that deserves such a quick description, given that its breathless characters never slow down. The rarely performed play also deserves this high-energy revival, with a cast of 20 who race across the stage, then dance around it at their curtain call."